I had to get a great deal because I knew it would need to be reupholstered and that is beyond my skill set for a couch like this. 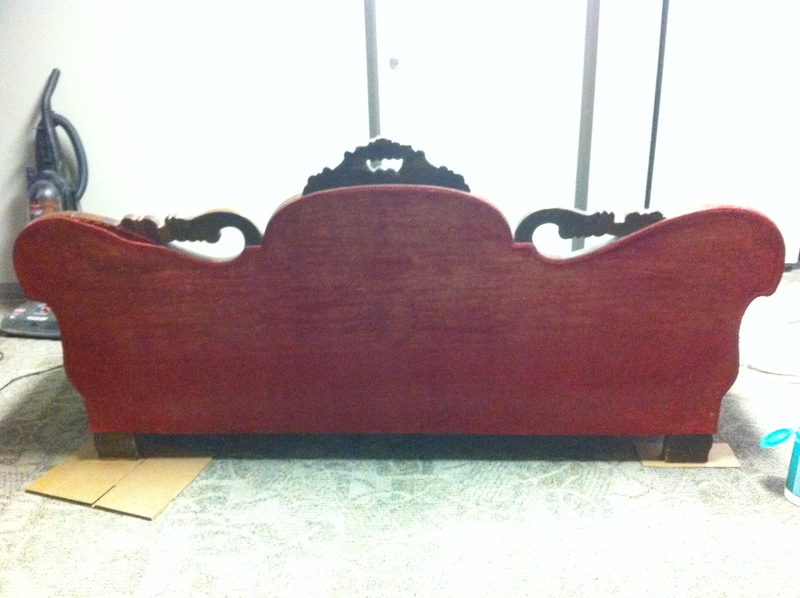 The wood had many scratches and dings and the red velvet fabric was faded and stained and worn. Pulling the trim off to paint the wood gave me some crazy allergies so I was glad to be getting rid of the fabric. I pulled the trim off to paint all the edges of the wood. 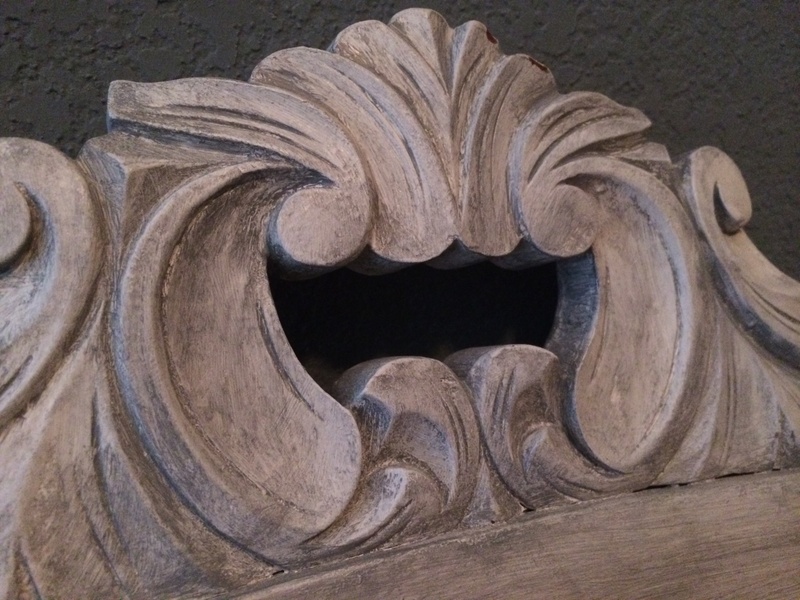 I’m sure many of you will be appalled that I painted this antique wood, but I was pregnant at the time and didn’t want to use strong chemicals to strip the wood, didn’t think it would be possible to sand in all the nooks and crannies, and the carvings were begging to be glazed to show off their curves. 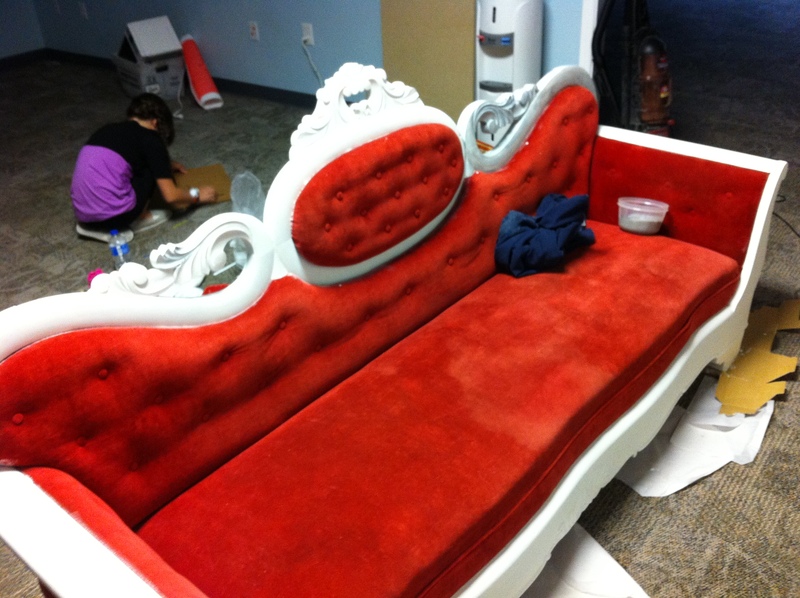 This is the couch set up and prepped for painting. You can see how scratched up the arm is and the discoloration in the fabric is because of stains, not shadows or fabric direction in the velvet. To prep the wood before hand, all I did was wipe it down as well as I could with disinfecting wipes. I decided to mix my own chalk paint. I had a random can of white paint leftover from the builders at my old house and used calcium carbonate powder to make the chalk paint. I promise to get that recipe up soon and will link to it when I do. 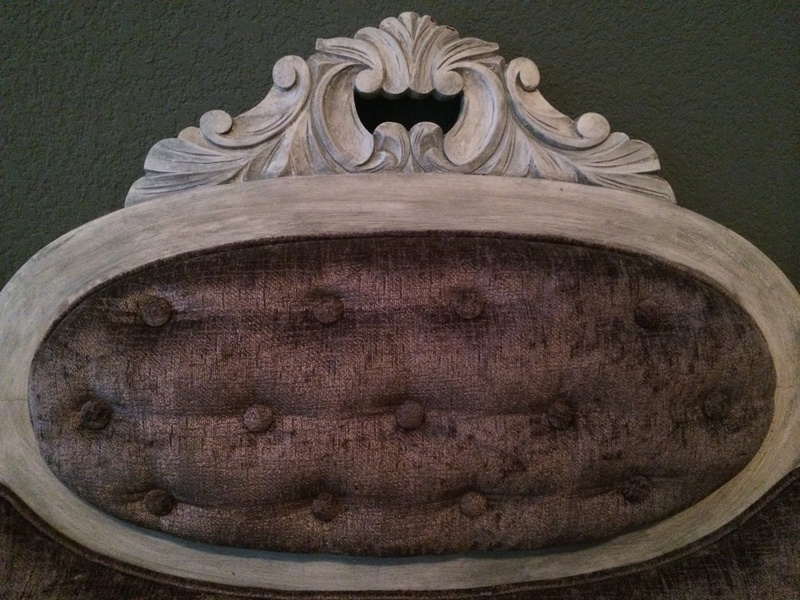 It took many coats to cover the dark wood with the white chalk paint. I had never had to use so many coats before. But at least chalk paint dries pretty quickly, so I didn’t have to wait long in-between coats. Seriously, though, like 5 or 6 coats of paint. I knew I wanted to have grey velvet fabric, if I could find it cheap enough, so to complement the grey fabric I hoped for, I wanted to use dark grey glaze. I found a $5 oops can of black paint at the store and added some black in small amounts to my white paint. To keep it uniform, in case I ran out, I measured the amounts. I believe I mixed two cups of white with two tablespoons of black. But I definitely added the paint in measurable amounts until I got it to a color of my liking. I then mixed this with my glaze according to the directions on the glaze container. I believe it was 1 part paint to 3 parts glaze. 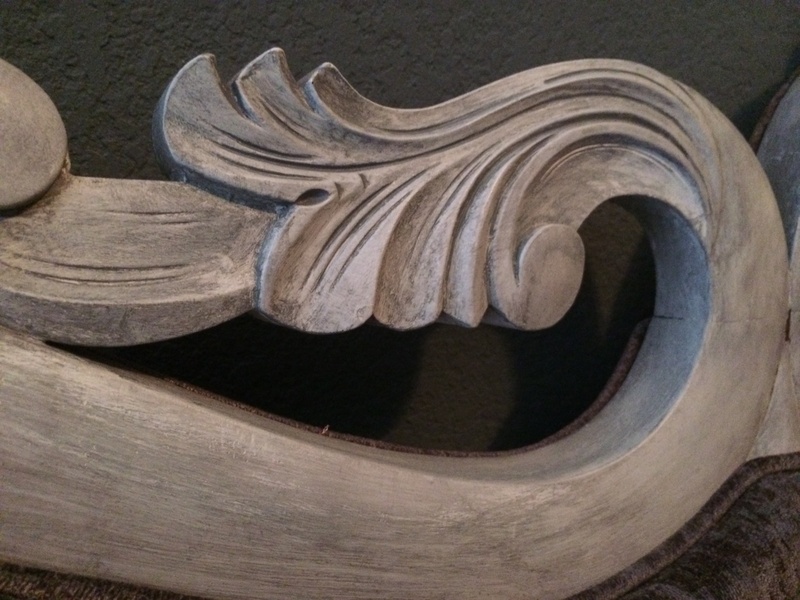 This mixture tinted all the white paint I had already painted on the couch to a shade of grey and I concentrated the glaze in the crevices of the carvings to get it darker before wiping the glaze off. I used an old t-shirt of my husbands to wipe the glaze off. If you ever find that you want to wipe off more glaze than is coming off with dry wiping, you can also use a little mineral spirits on your rag to wipe the glaze off the surface. After the glaze dried, I went back and sprayed the wood with Spray Polyurethane in Clear Satin. I didn’t want a glossy finish and the satin finish just gave a nice sheen. I also wanted to protect the wood a little more since it was going to go get reupholstered and then be near my children again sometime after that. I did find the gorgeous grey velvet fabric I wanted, after much searching, and it was on sale for $9/yard. I had the couch reupholstered by Back Alley Furniture and they did a great job and were a pleasure to work with. I absolutely love this couch. Where it currently sits in my master bedroom does not do it justice. We lived in a different house when I got this couch and had a gorgeous formal living to show off this beauty. I’m still trying to talk my husband into moving this into our front-office-turned-sitting/music-room, but he keeps saying something like, “It’s really heavy, blah, blah, blah.” I tell him that’s why I married him, to do the heavy-lifting 🙂 We’ll see who wins. At the very least, I have to paint my bedroom walls to give it a proper backdrop. But that’ll be a posting for a different day. What do you think of this Victorian Reformation?? We’d love to hear your comments below! Thanks for checking out our Tuesday Treasures this week!